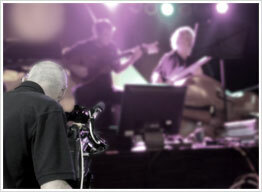 Liveonlinecanada is dedicated to bringing live musical and cultural events to the world. Presenters of music festivals, concerts, charitable fundraisers, any event can benefit by increasing audience size on the web. Paid concert viewing, donation options, sponsored events are all possibilities with our versatile and customizable services. Liveonlinecanada will go to great lengths to offer support materials for event presenters in the form of pre-promotions, performer interviews, viewer education pertaining to the event organizers’ goals, eg. health promotion events where health education is paramount to the event. liveonlinecanada is adaptable and can pattern the presentation to best reflect the intentions of the event organizer, this adaptability and the capabilities of the experienced team at liveonlinecanada goes a long way towards making your event a success – worldwide.